Heat oven to 375°F. Spray 13x9-inch (3-quart) glass baking dish with cooking spray. Separate dough into 8 biscuits. Place in dish, touching. Using sharp knife, cut two X-shape slits about 1/2 inch deep in top of each biscuit. Bake 17 to 20 minutes or until golden brown and cooked through in center. Meanwhile, in medium bowl, mix turkey and cheese. Cool biscuits 2 minutes. Spread and press each biscuit open to form a cup. Brush biscuits with olive oil. Fill each biscuit with turkey mixture. Sprinkle with pepper. Bake 11 to 14 minutes or until cheese is melted and mixture is hot in center (at least 165°F). Sprinkle with tomatoes and basil. 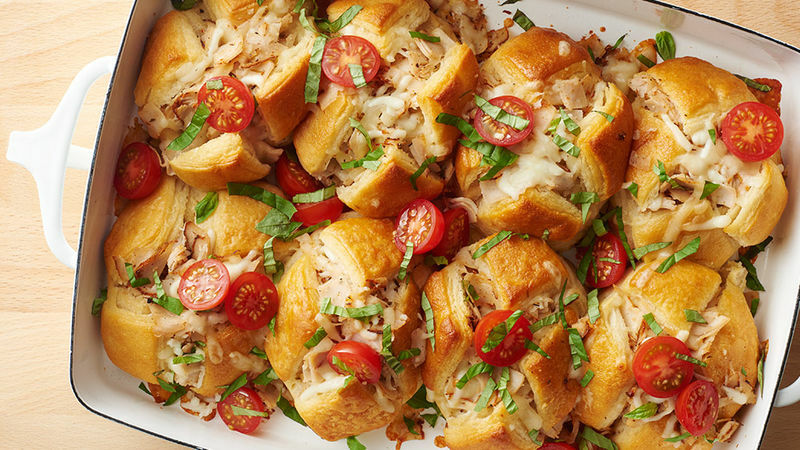 Play around with the stuffing flavors -- try sliced deli chicken and shredded Cheddar. Have more than enough fresh basil in your herb garden? Make a fresh pesto to drizzle on top in place of the shredded basil.